These concert notes were prepared by soprano Ginnie Carey. This dramatic piece was composed especially for the 2009 Christmas at Belmont National PBS telecast by Dr. Ames, Director of Choral Activities at Belmont University. 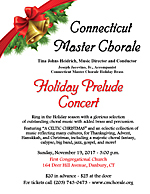 Opening with a resplendent brass fanfare, his own lyrics in English are entwined with the traditional Latin text to create a jubilant, majestic new Gloria in Excelsis Deo. An acclaimed young composer, especially of choral works, Dan Forrest has become one of the Chorale's favorite composers in recent years. His original setting of Psalm 92:1-2,4 on the theme of thankfulness is filled with energy and joy. Seamlessly blended into the accompaniment is a portion of the tune Nun Danket Alle Gott (Now Thank We All Our God) by Johann Crüger (1598 - 1662), which was also incorporated by both J.S. Bach and Felix Mendelssohn into their own works. This lovely carol was first published in The Masque of Mary and Other Poems by Edward Caswell in 1858. John Goss wrote the tune Humility specifically for the poem and it was published that same year in "Christmas Carols New and Old". Dan Forrest's reverent arrangement is embellished with Alleluias and exudes a quiet, ethereal beauty. Composer, conductor and humorist, Mr. Choplin has gained a reputation as one of the more creative writers in church music today, as seen in this unusual combination of two popular songs. Happy Birthday, the most recognized song in the English language, is generally attributed to two sisters, Mildred J. Hill (1859 - 1916) and Patty Smith Hill (1868 - 1946). Patty was a school teacher and faculty member at Columbia University Teachers College and Mildred was also an educator as well as composer, organist and pianist. With melody by Mildred and lyrics by Patty, it was originally a classroom greeting song titled "Good Morning to All". The details of how it was turned into a birthday song are unclear, but the birthday version was first published in 1924. Away in a Manger is a song with a very odd and perplexing history and is attributed to James Ramsey Murray (1841 - 1905). He first published it in his 1887 collection Dainty Songs for Little Lads and Lassies, claiming that it was a well-known lullaby in Germany and written by Martin Luther, but used his own initials as songwriter. There has been much discussion as to why he did this, but the next year he published it again in another collection, Royal Praise for the Sunday School: a collection of new and selected gospel songs by J. R. Murray, with "Music by J.R. Murray" and a copyright notice that the earlier publication lacked. Since the song doesn't appear in Martin Luther's writings and the earliest German printing was in 1934, years after the song was popular in America, it is assumed that Murray invented the German story for his own inscrutable reasons. Today it is one of the best-known carols in the English-speaking world. An eclectic grouping featuring three diverse Celtic pieces. Irish songwriter and best-selling novelist Brendan Graham was described in the Irish Times as a "musical Midas". He has written songs for a diverse group of artists including Josh Groban, Ronan Tynan, Katherine Jenkins, The Irish Tenors and Il Divo. Christmas Pipes was recorded by Celtic Woman, the all-female Irish musical ensemble, on their A Christmas Celebration CD and PBS television special that has become a seasonal favorite. This distinctive Celtic carol was first composed and recorded as an instrumental piece by Michael Smith on his album It's a Wonderful Christmas. Tom Fettke enhanced it with classic Christmas texts from Charles Wesley and Christopher Wordsworth, and then collaborated with Thomas Grassi to complete the transformation into this unique tribute to the spirit of the Highlands. Eithne Ní Bhraonáin is a classically trained Irish pianist and singer, with a distinctive ethereal voice, who uses the name Enya because it is the correct way to pronounce her first name. The group Enya is really comprised of three people, Nicky Ryan, his wife Roma Ryan and Enya herself. Roma Ryan is the primary lyricist, Nicky Ryan is the producer and Enya's unique sound comes from layering 80 or more tracks of her voice, but all three are essential to the creation of their hypnotic Celtic New Age sound. This lovely story of the angels traveling to the newborn king comes from their 1980 album And Winter Came. An award-winning concert pianist, composer, arranger and conductor, Mark Hayes has created a majestic choral fantasy featuring unique arrangements of seven traditional carols. Masters in this Hall has particularly interesting origins, as the lyrics were written by a 26-year old William Morris (1834 - 1896) the brilliant textile designer, craftsman and poet whose designs for the decorative arts generated the Arts and Crafts movement. He wrote it specifically for the tune Marche pour les Matelots, written by the celebrated French court musician, viola da gamba player and composer Marin Marais (1656 - 1728) for his 1706 opera Aleyone. From there the tune entered the world of French county dance and eventually became a part of the English country dance tradition as well. I Saw Three Ships first appeared in Christmas Carols, Ancient and Modern, collected by William Sandys and published in 1833. The tune is similar to many others from the period and it is believed to have originated in Derbyshire, but the actual origins are unknown. The other mystery involves the lyrics and the meaning of the lyrics. Bethlehem is miles from the coast and a ship couldn't sail there, so what does it mean? One interpretation is that these ships are the three Magi coming to see the baby Jesus on their "ships of the desert" or camels. Sussex Carol is another old carol, with lyrics that are attributed to Bishop Luke Waddings (1628 - 1691) who was Bishop of Ferns, Ireland. It was published in his book, Small Garland of Pious and Godly Songs in 1684. The text and the tune were collected by Cecil Sharp and also by Ralph Vaughan Williams (1872 - 1958) who heard it sung in Sussex and published it in 1919. How Far Is It to Bethlehem? is a poem by playwright and poet Frances Chesterton (1869 - 1938), the wife of British author G. K. Chesterton. Written in 1917, it is the best known of the many poems she wrote for their Christmas cards and has traditionally been set to the 16th century hymn tune Stowey. Arranger Mark Hayes has taken some lines from this song and woven them into the next one as well. O Little Town of Bethlehem was written by Phillips Brooks (1835 - 1893), who made a pilgrimage to Bethlehem in 1865. He traveled by horseback from Jerusalem and participated in a five-hour Christmas Eve service at Constantine's ancient basilica (326 AD), built over the traditional site of the Nativity. Three years later he wrote the poem for the Sunday school children at his Philadelphia parish, Holy Trinity Church and gave it to the organist of the church Lewis Redner (1831 - 1908) with a request that he set it to music by Sunday. Mr. Redner related that he fell asleep on Saturday night and woke late in the night "hearing an angel-strain whispering in my ear" and seized a paper to write down the tune, which is titled St Louis. A wealthy real estate broker who played the organ in the church as an avocation, Mr. Redner later recalled that "Neither Mr. Brooks nor I ever thought the carol or the music would live beyond that Christmas of 1868." What Star Is This? began as a poem from the prolific poet Charles Coffin (1676 - 1749) who was rector of the University of Paris. All of his poetry was written in Latin, and this translation is by John Chandler (1806 - 1876), one of the earliest and most successful translators of Latin hymns. The melody is Puer Nobis Nascitur (Unto Us Is Born a Son), a 15th century piece found in Trier, Germany, which was adapted in 1609 by Michael Praetorius (1571 - 1621) to become the tune we are familiar with today.